CUT ENGINEERING WALKS AWAY WITH PRESTIGIOUS AWARD FOR THE 2ND YEAR! Ms Aucamp, a master’s student in the Department of Information Technology at Central University of Technology, Free State (CUT) will join a selected group of students from South Africa universities as a recipient of Abe Bailey Travel Bursary Award. This bursary was awarded for her outstanding academic performance and exceptional qualities. Now, a new member of this exclusive ambassadorial group from CUT, Ms Aucamp will travel to the United Kingdom at the end of 2013 on an all-expenses-paid trip. This is not a first academic achievement for Ms Aucamp; in 2012 she was awarded the prestigious Vice-Chancellor’s Award for best Academic Performance at BTech level. “This is confirmation of the quality of graduates we as a faculty deliver” said Prof. Herman Vermaak, Acting Dean of the Faculty of Engineering and Information Technology. The objective of the Travel Bursary is to broaden the views of young South Africans through travel, engagement, and each member will be expected to do a presentation at the Goodenough College in London, where they will be hosted for close to a month. The Abe Bailey Travel Bursary has been in existence since 1951, and so far CUT has been represented three times, Ms Aucamp is the fourth. In 2012 Mr Mphikeleli Jele was awarded the prestigious Abe Bailey Travel Bursary. “It is a great honour for CUT to have one of our students winning the ABE Bailey Travel Bursary. The group of bursars will be given the opportunity to equip themselves with exceptional leadership qualities and strong service ethic. A greater understanding and co-operation among those with various language and cultural backgrounds, and to foster enterprise, commitment and effective participation in a common future are just some of the items on the agenda”, said Prof. Henk de Jager, Deputy Vice-Chancellor: Academic. Image: Ms Aucamp, a master’s student in the Department of Information Technology will join a selected group of students from South Africa universities as a recipient of Abe Bailey Travel Bursary Award. This bursary was awarded for her outstanding academic performance and exceptional qualities. 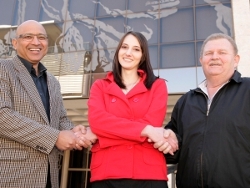 Congratulating Ms Jenny Aucamp is (left) Dr Daryl Balia, Director of Academic Planning Unit; and Prof. Herman Vermaak, Acting Dean of the Faculty of Engineering and Information Technology (right).